There's something to be said for a rainy Sunday afternoon - gray skies, a steady drizzle, slipping back into bed and napping the afternoon away. But, instead of sleeping, we are eating. This dish is like your favorite blanket, warm, soft and familiar. This is a dish from Eric's childhood. His mother made it for him when he was little and he made it for me while we were dating. It's still one of our favorites. I consider this more of a process than a recipe. First comes the chicken. 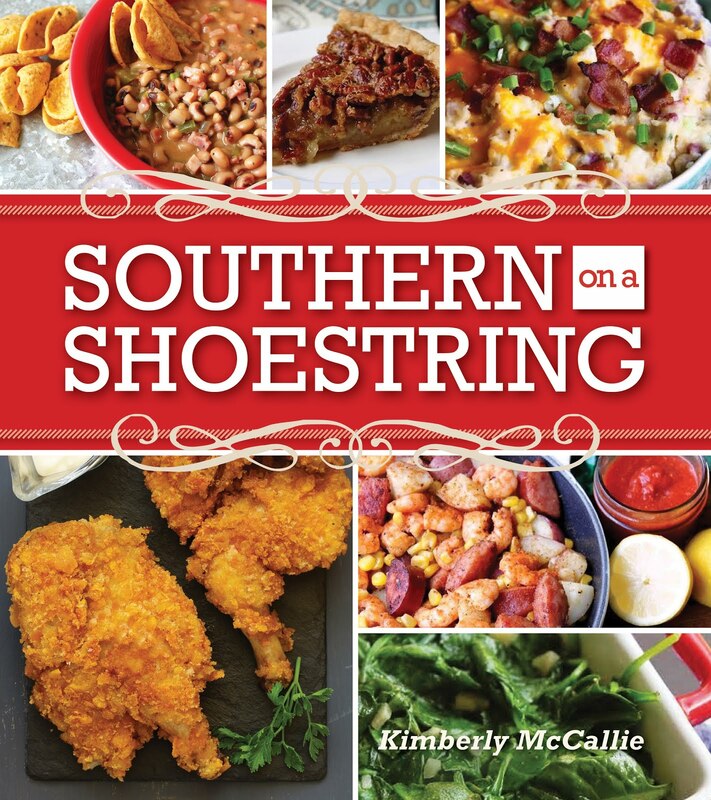 We've done this a number of ways, bone-in chicken breasts, boneless chicken breasts, and a whole chicken. I really prefer the whole chicken because I think the dark meat makes the dish more flavorful. But, today we used what we had on hand which was bone-in breasts. I cooked five breasts in a well-seasoned broth. My seasonings of choice are seasoning salt, garlic salt, pepper, granulated chicken bouillon, and a tablespoon of chopped garlic. After the chicken is cooked and cooling down, I start on the dumplings. This is the easy way to make dumplings but it can still be a little time-consuming. I use these biscuits. I've always used this brand of biscuits. 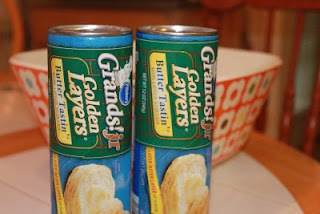 The name of them has changed over the years but I look for the Butter Tastin' Golden Layers biscuits. I put about 2/3 cup of all-purpose flour on a plate and flatten each biscuit to 4" round and slice each round into 16 pieces of dough. When I'm done, the biscuits look like this. 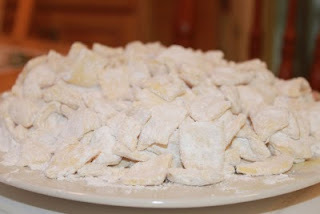 I make sure that all of the pieces are coated with flour. 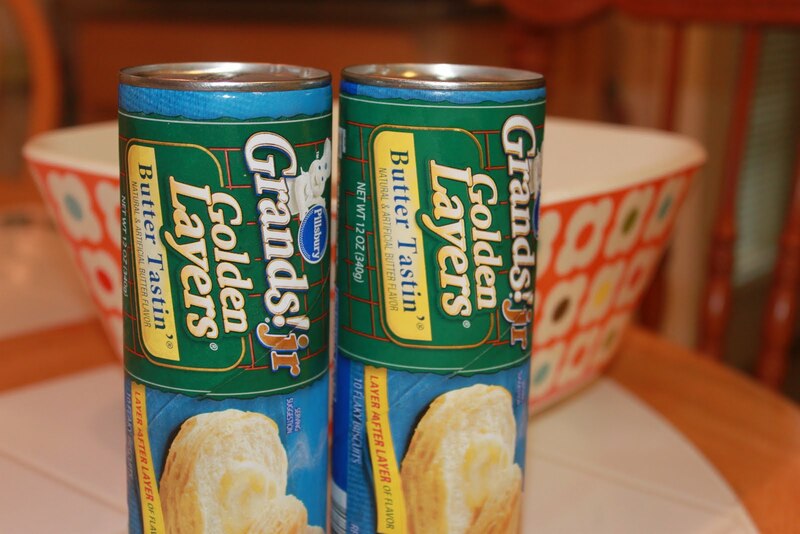 I use two cans of biscuits for one large pot of dumplings. 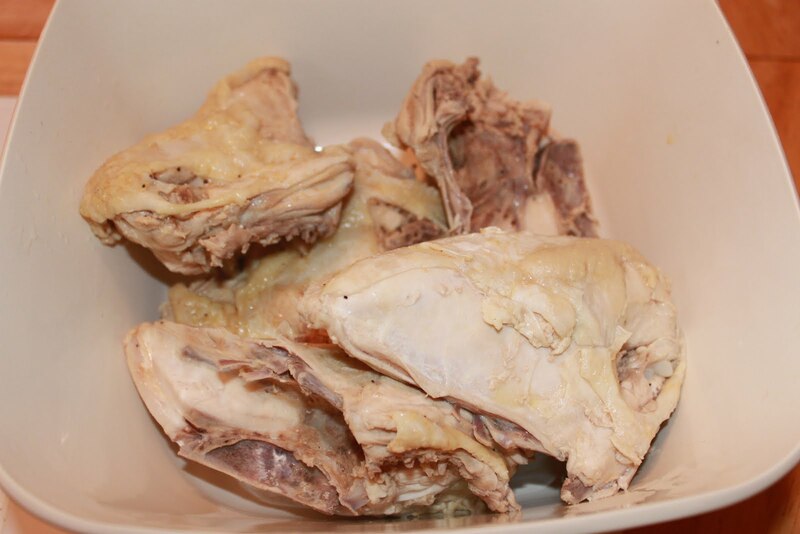 After I cut up the biscuits, I remove the chicken from the bones and shred it. 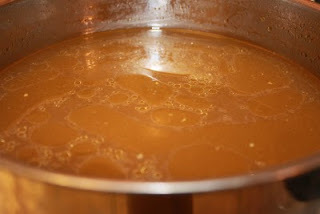 When I go back to my pot of chicken stock, I remove some of the broth if I think the pot will get too full. 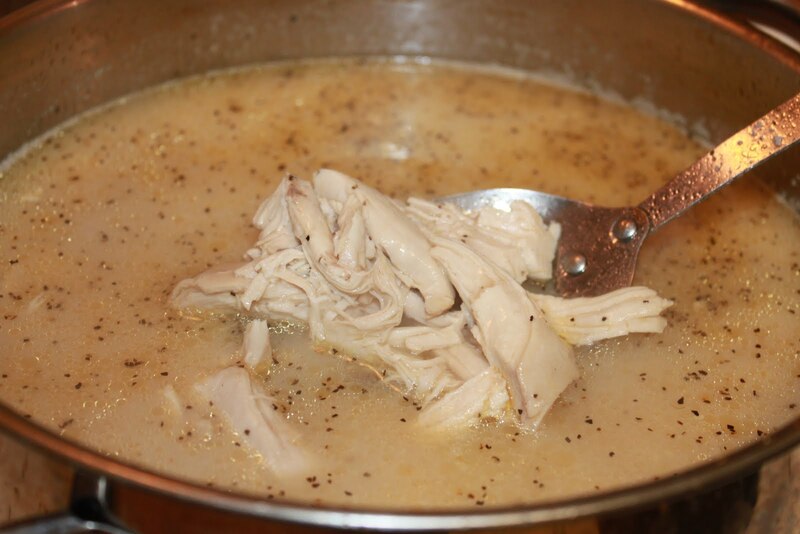 I then add two cans of cream of mushroom soup and return the chicken to the pot. Bring the pot back to a boil before putting the dumplings in. Add the mushroom soup and return the chicken to the pot. Bring to a rolling boil before adding dumplings. 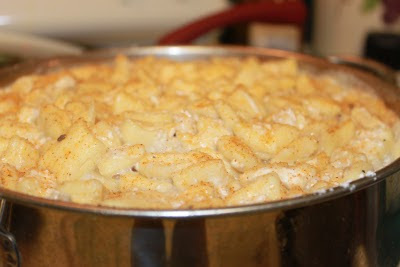 Pour all of the dumplings into the pot, including all of the flour that was on the plate. I always sprinkle on another layer of seasoning salt for good luck. Now, don't be scared. The dumplings will puff up and come all the way to the top of the pot. Just keep stirring gently to separate the dough. Turn the heat down to a medium-low setting. Place the lid on the pot and cook the dumplings for 30 minutes, stirring every 5-8 minutes to keep the dumplings from sticking together. After 30 minutes, turn off the heat and leave the lid on. Let them sit for about 30 minutes before eating. The chicken and dumplings actually taste better after they've sat for a while and thickened up a bit. This looks so delicious. I have to try it. I love the idea of using the biscuits for the dumplings. 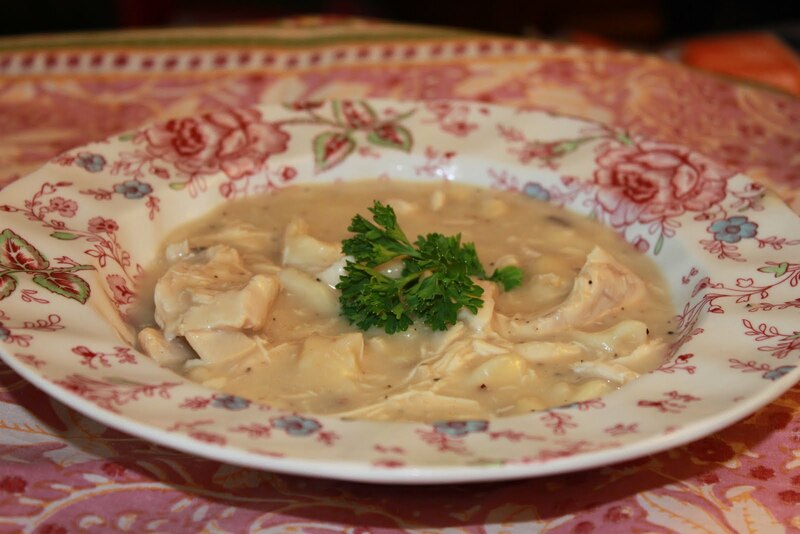 I have always made the dumplings out of biscuits, but I've never used cream of mushroom soup. I'll try that next time. This was a wonderful recipe. After 30 minutes, some of the dumplings began to dissolive in the broth. I may have to cut the cooking time down a little bit (maybe 10 minutes).